Frieda Riggs and her husband Arad bought the Abijah Morgan house in 1937, and in 1999, Mrs. Riggs bequeathed it to the Bronxville Historical Conservancy. It is Bronxville’s oldest house, believed to be built in 1810. Charles Morgan owned the land before 1760 and the first recorded sale of the house was in 1811 to Ensign Abijah Morgan, who owned the property from 1811 to 1818. Militia men, including Ensign Morgan, mustered there on September 12, 1812, before marching to Yonkers and then on to New York City to do battle with the British. One of the first founding members of the Conservancy, Frieda Riggs embraced the organization because it is committed to issues and objectives for which she had been a strong advocate for more than six decades. Her wish was that her home, a community “treasure,” continue to be owned, lived in and loved by a single family, just as it has been by the Riggs and other families for the last two centuries. The proceeds from the sale of the house at 339 Pondfield Road, nearly $1 million, have enabled the Conservancy to move forward with its mission of preserving the rich heritage of this village. There are in every generation a few individuals who are singled out because their lives have an impact on whole communities. Frieda Wildy Riggs was one of these people. She did not achieve a fame that was bestowed because of public office, media exposure, or a particular talent, but because of the ways in which she touched the lives of so many individuals for over 92 years. 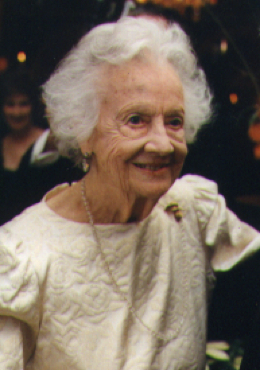 Frieda Riggs had a passion for education that she shared with others of all ages, from the school children who yearly visited her historic home, to the college students here and in Japan who participated in programs she supported, to the friends and associates she challenged to never stop learning because of her own excitement for books, ideas, and dialogue. Her genuine interest in people and their welfare motivated her to choose a profession in social service and, afterward, an avocation in community service — the school, her church, the library, the Village, all were beneficiaries of her time and her intelligent and compassionate approach to issues. She loved history and tradition, but was never outdated; she epitomized firm values, but was always accepting of others’ opinions and cultural diversity.